Class: IV - V ( depending on flow ), 1 mile long, 260 fpm, Pool-drop. 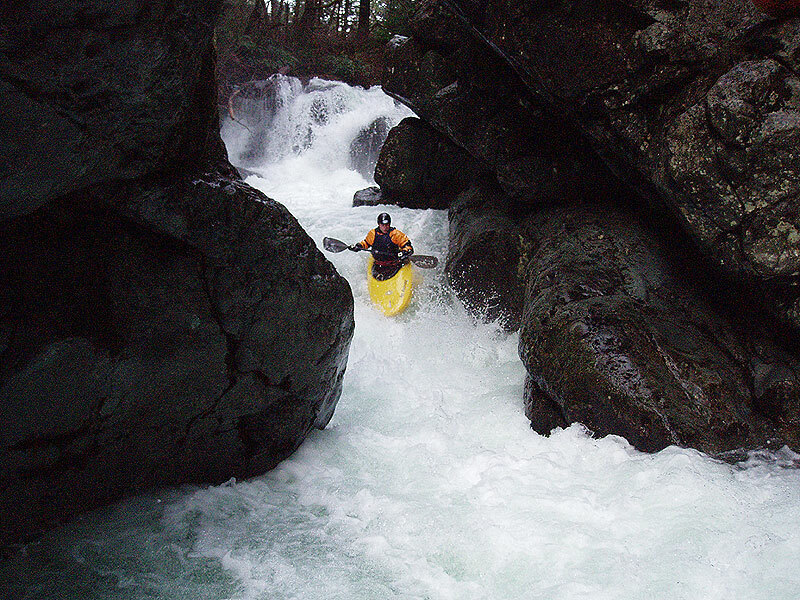 Click here to watch a kayaking video shot during the second known descent of Hagen, produced by Jason Rackley. 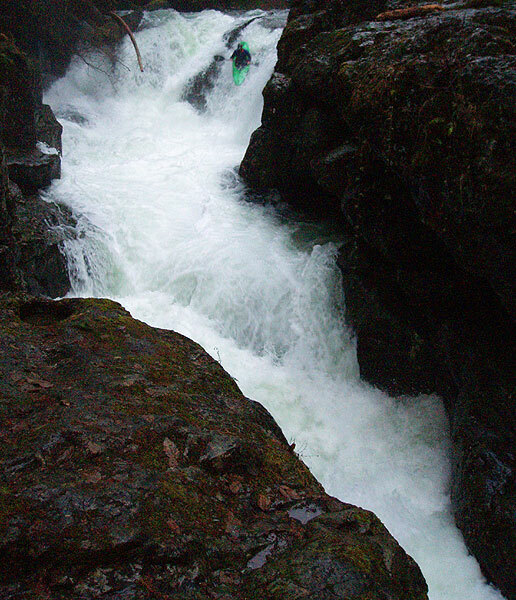 We did the first known descent of Hagen Gorge at the tail end of our marathon 'Four in Three' weekend during the epic 2005-06 New Year's flood. 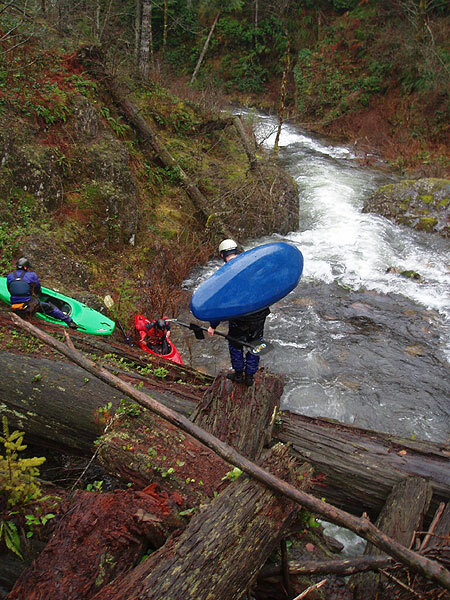 We had discovered a gold mine of creeks in the headwaters of the North Fork Washougal, and we were working our way through them while the water was high. On Friday we had run Wildboy Creek, Saturday Jackson Creek, and now it was Sunday. We ran Skamania Mine creek first thing Sunday morning, then put on Hagen in the afternoon. We were on a roll at this point, having done three first known descents in three days, and we did Hagen almost as an afterthought. It wasn't nearly as steep as the others, and we didn't have too much hope that it would be any good..
After taking off of Skamania Mine Creek ( which flows into the Upper Upper Northwest Fork Washougal ) we piled into Jon's Volvo and headed upstream. Fortunately we had already set shuttle ( we had planned on running both creeks in one day if we had time ) so we were able to load the car and go. 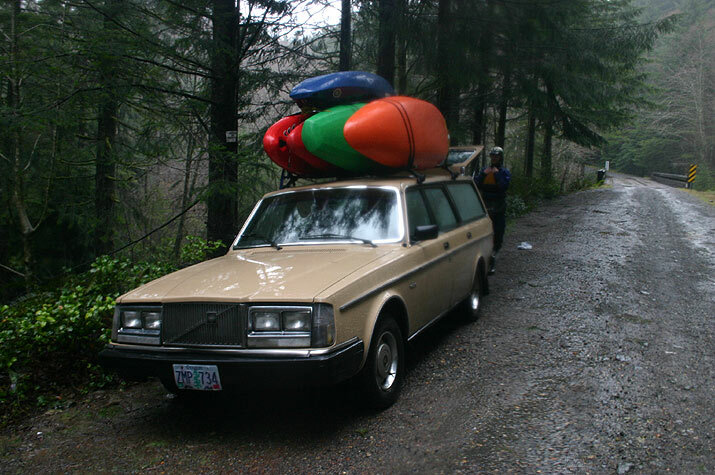 Piling into Jon's Volvo at the take-out for Skamania Mine Creek ( which is the put-in for the North Fork Washougal in the Bennett Guide ). We continued up the road from the bridge over the Northwest fork until the road veered sharply to the right and ran away from the creek. There was a large clear-cut on the left side of the road, so we parked at the corner and started hiking.. Hiking through the clear-cut to reach the put-in for Hagen Creek. From our map recon we knew that there was a tiny trib coming in on creek-left, so we thought this might be a good place to descend to the creek. 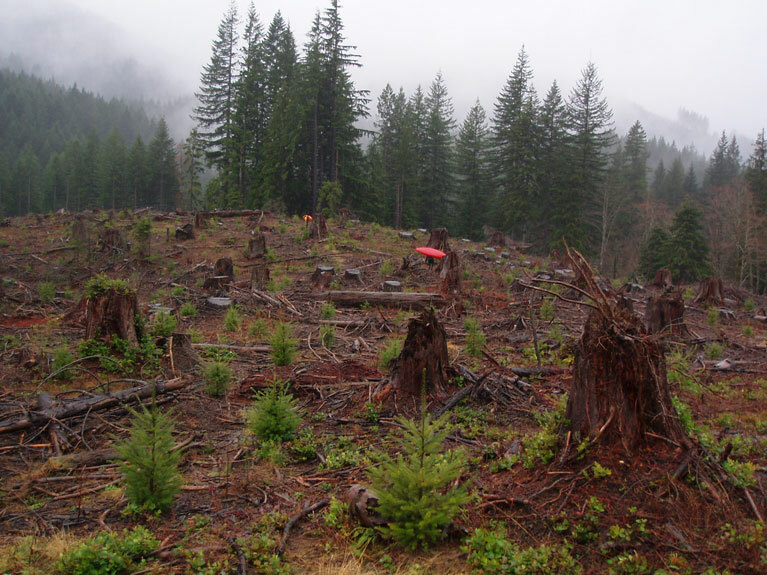 This plan changed somewhat when we reached the woodline and found it very easy to move around because of the size of the trees and the lack of undergrowth. In order to ensure we didn't miss any of the gradient, we angled upstream slightly and ended up crossing the trib, descending through some massive old-growth trees to the put-in, just upstream of the confluence with the little trib. We put on and were immediately confronted with a horizon line, which turned out to be a fun little slide-drop off a headwall going right..
Pete Giordano runs the first drop on Hagen Creek while James Bagley Jr. looks on. Immediately below this first fun drop were a series of smaller pourovers, then the creek flowed into what appeared to be a lake of some sort. "Oh no.." I groaned inwardly. "What the @#$ is this?!?" We cruised out onto the 'pond' and saw what appeared to be a beaver dam downstream, but when we arrived at the top of it we found one of the tallest logjams any of us had ever seen! This jam is about fifteen feet tall and has a massive five-foot diameter log as it's linch pin. The jam was simple to negotiate, we just walked down the face of it and put in at what appeared to be the entrance to an impressive-looking gorge. "Now THAT looks good." I said, and we all started to feel a glimmer of hope that this creek might just prove to be worth doing..
( We later found out from a local resident that the logjam is actually the remnants of an ancient wooden dam, built long ago for some forgotten purpose ). Portaging the old dam structure. This dam also plays a very important role: it keeps the gorge below totally free of wood! Below the logjam the creek started to gorge up, and we encountered some small, ledgy drops. Soon the creek rounded the corner and dropped over a horizon line. I got out on the left to scout and take photos of what turned out to be the first in a series of fun, short ledges.. totally classic stuff..
James Bagley Jr. runs the first in a series of fun ledges in the gorge..
Now we were starting to get excited! The geology was excellent, there was absolutely no wood, and we were all thinking the same thing: There might be a waterfall in here somewhere..
And then, almost as if we willed it into existance, we rounded the corner and were faced by a large horizon line. We piled out onto a convenient ledge on the creek-right and beheld.. a perfect, utterly clean fifteen foot waterfall. "What do we have here?!?" I shouted gleefully.. "MEEEERRRRY CHRISTMAS!!" Yeah, it was something to see. Mike fired it off first, melting off the middle, and then the rush was on.. Since he made the first known descent of this falls, Mike later named it 'Hagen Daaz'.. Soft, sweet, and fluffy..
Below Hagen Daaz the gorge wound through some twists and turns and some smaller drops. At this point my big-drop radar was going off; I was starting to get worried that we might run into a huge, unrunnable drop that would be difficult/impossible to portage, effectively ruining the run.. Almost as soon as I completed this thought the creek bent sharply to the left and dropped out of sight with a tremendous roar. We got out on the right and saw what appeared to be a large, multi-tiered drop with a final steep, horizon line.. The scout was fairly easy on the right with a steep scramble, and soon there were a lot of heads nodding as everyone started to work out the line over this complex, difficult drop.. 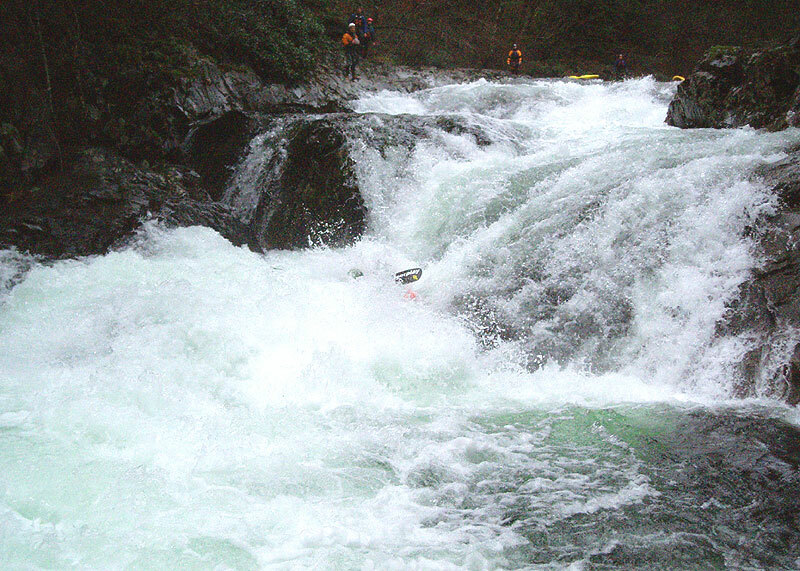 The first drop was a fifteen-foot dome falls dropping into a narrow slot on the left, then another hole, followed by a screaming right turn into a deep, soft hole followed immediately by a horseshoe-shaped final falls..
Jon Fowlkes and Mike Long got back up to their boats and Mike said to Jon: "Well, you want it?!?" Jon just grinned. "Hell yeah!.." As Jon got ready to probe, the rest of us set safety. Once we were all set, Jon came tearing down the first dome-shaped falls, plunged through the first two holes, and then charged back to the right as the creek swept him around to the left side, driving off the right side of the bottom falls perfectly.. yeah!! Mike Long was next, and he fired it off perfectly as well, and then again, the rush was on! Everyone had clean lines over this one..
Mike Long makes the second known descent of Euphoria Falls, a complex 30-foot cascade. 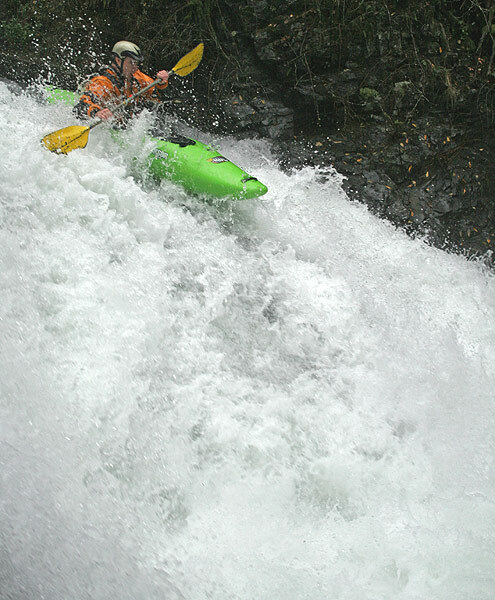 Jon Fowlkes probed this one..
Below Euphoria was another ledge, then shortly downstream was the confluence with the Northwest Fork at Teakettle Falls. Everyone fired Teakettle off with only one beat-down in the bottom hole, no worries though. Now we were in familiar territory and we moved swiftly downstream, enjoying the classic class four stuff on the North Fork Washougal. 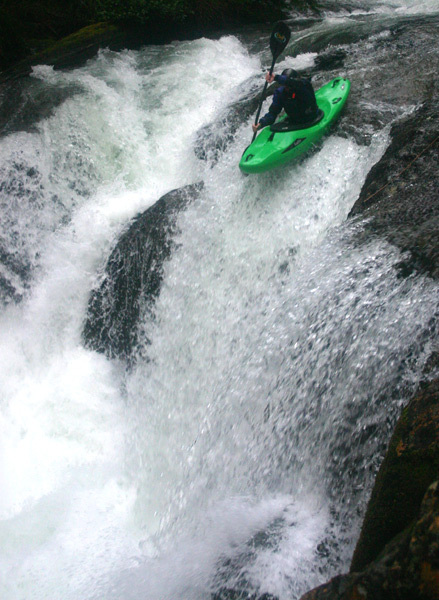 Soon we arrived at the crux drop of the trip, the big double falls, which is definitely the toughest drop on the run. Everyone portaged and seal-launched on the left without thinking about this one but Mike gave it a long look. After studying the bottom hole for awhile and considering the moves just above it he gave us a thumbs up..
Mike Long runs the class V double falls.. Same drop.. a second later, shot from downstream. 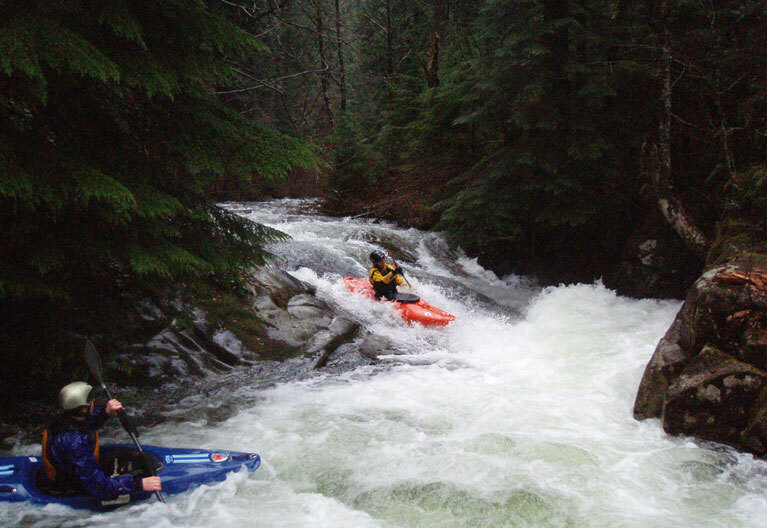 Follow the directions to the North Fork Washougal in the Bennett Guide. See map below for more details. 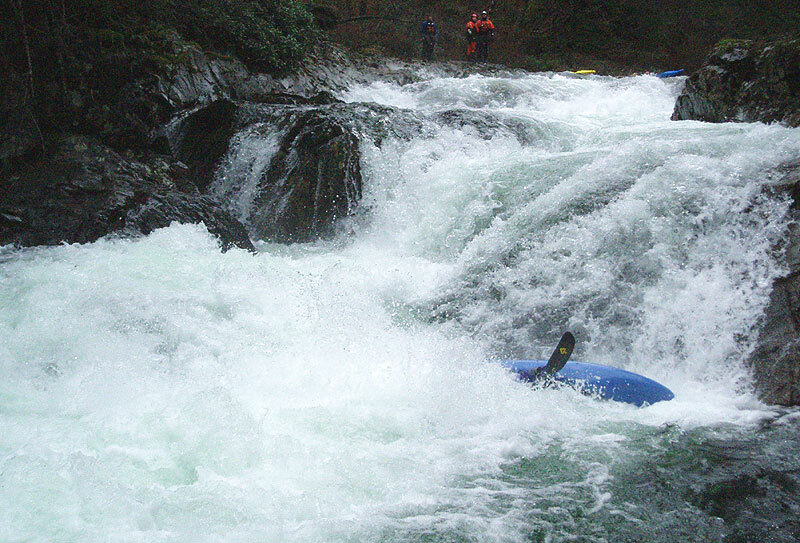 I recommend taking out at the fish hatchery on the North Fork Washougal, so you get a nice big-water class IV and V ride through the best rapids on the North Fork. If you are looking for a shorter day, you can take out at the upper bridge over the North Fork as well. 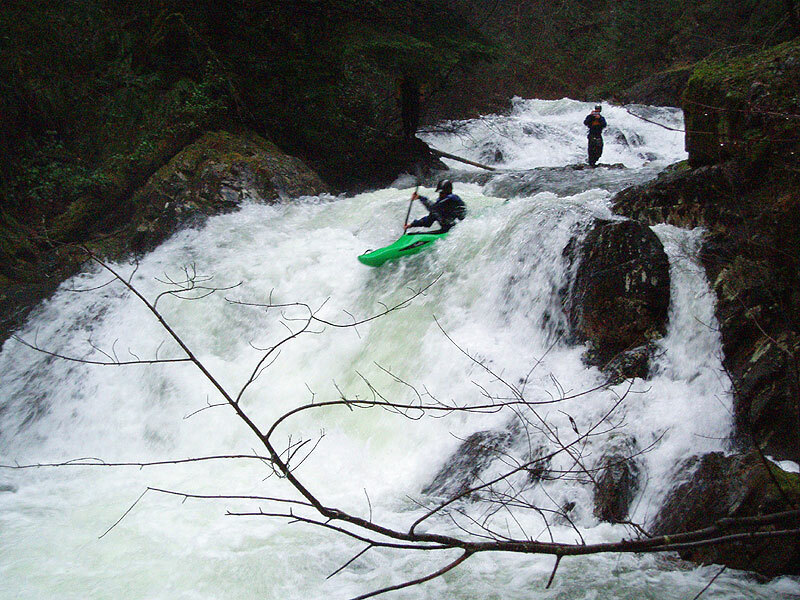 Drive to the put-in for the North Fork Washougal as detailed in the Bennett guide. Continue past the bridge over the North Fork for a half mile until the road bends sharply to the right and goes uphill. 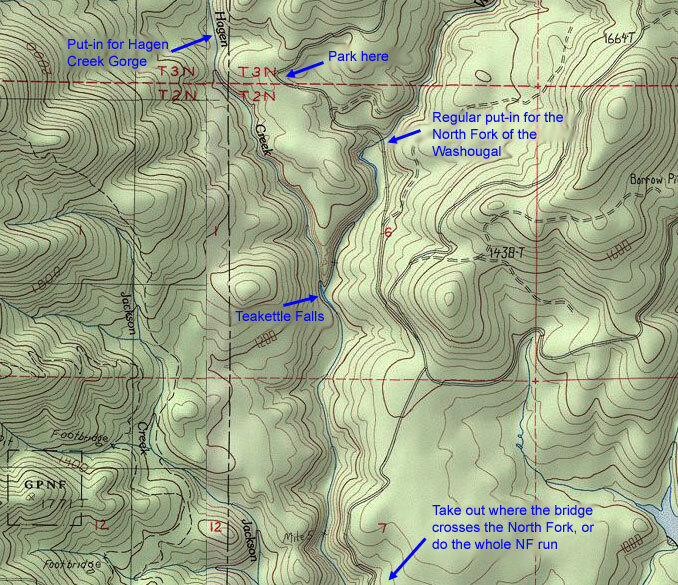 Start hiking from here, heading generally Northwest into the stand of trees as pictured in this report. You are looking for the tiny stream that forms the little gully on the map below. Once in the trees this is easy to find. Continue to bear right, looking for the faint trail that winds down through the trees. Cross the little stream, then hike down through the old growth to the put in. You shouldn't have to hike through a lot of brush to reach the creek, if you are then start looking for the trail. For flows, you want 2,500 minimum in the EF Lewis at Heisson, or 3,000 cfs / 8.5-9.0 feet on the Washougal at Washougal guage, which is actually the best predictor for this creek. 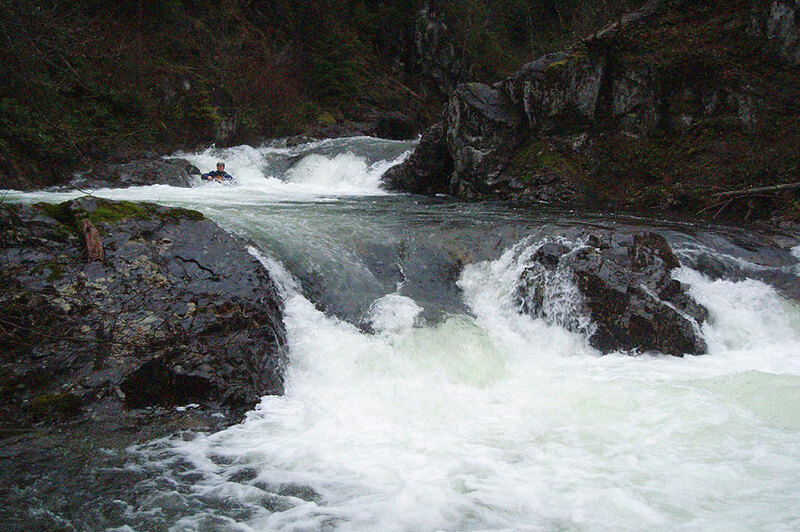 Hagen can be run lower but gets very rocky in the short section leading up to the log dam, though the main gorge where the majority of the rapids are located is fine at low flows because the creek channelizes well. Hagen is also strongly affected by snow and freezing levels. If the freezing level is 2,000 feet or lower and rain falls elsewhere, Hagen will only receive snow and will not rise as expected. This 'snow effect' is similar to that seen on Upper Quartzville and intensifies as the freezing level decreases. Therefore, a freezing level of 1,000 feet will lock up all moisture in the drainage, leading to much lower actual levels than might be expected as the lower-level gauges on the EF Lewis and Washougal rise. Due to it's higher elevation, Hagen has snowmelt events in the spring if conditions are right. 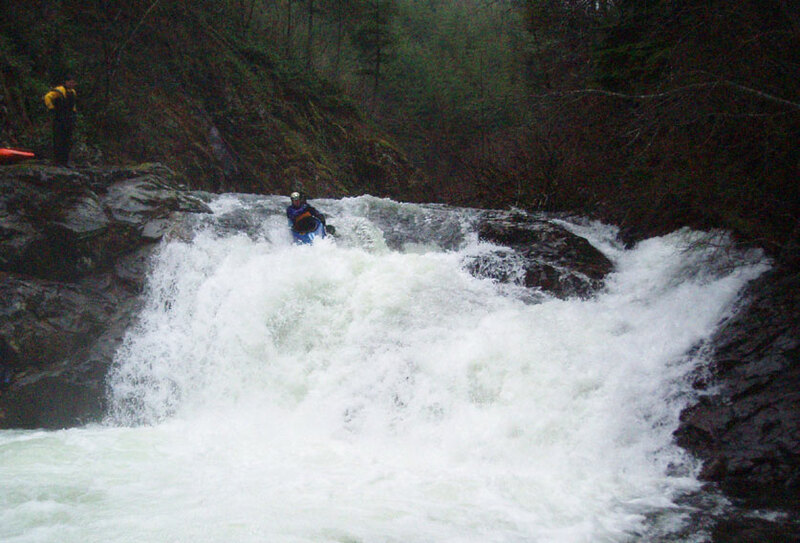 For example, in May 2008 Josh Knapp and I ran Hagen at a very nice flow when the Washougal at Washougal was at 1,000 cfs/6.5 feet. Ordinarily ( during the rainy season ) this would be far too low, but we were sitting on a record snowpack and had a couple of very hot days, and Hagen ran strong. Click here to see photos from that day. We ran this creek at the tail end of the 2006 New Years Flood. The flow is indicated by the blue bar below. NOTE: This flow is good only if the freezing level is above 2,000 feet. Otherwise, all of the water that falls in the Hagen drainage will be snow and the creek will be lower than expected.